Marked 12 (for silver 750/1000), this silver soup ladle is made in one of the the German speaking countries, in the first half of the 19th century. It is probably Biedermeier, but it may predate that period. It is 37 cm long and weighs 192 grams. On the back of the paddle there is pricket engraving that says "S. Block". On the face of the paddle is a cypher of the letters A and B. 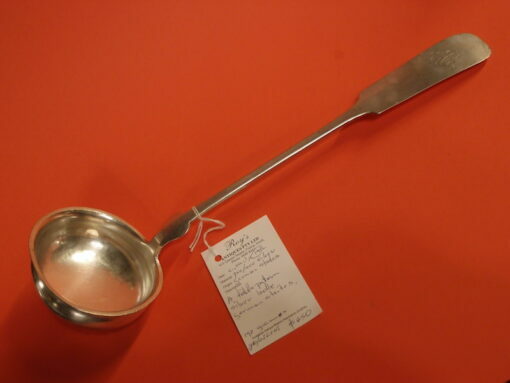 Marked 12 (for silver 750/1000), this silver soup ladle is made in one of the the German speaking countries, in the first half of the 19th century. It is probably Biedermeier, but it may predate that period. It is 37 cm long and weighs 192 grams. On the back of the paddle there is pricket engraving that says “S. Block”. On the face of the paddle is a cypher of the letters A and B.